Wherever we go, we leave our mark; wherever we settle, we interact with the landscape; in whatever place we inhabit, we are inhabited. 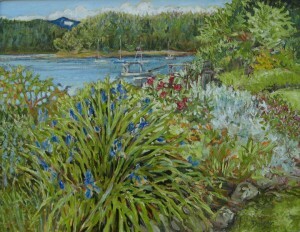 The paintings for this show focus mainly on gardens of Galiano, on the marks people make on the land, on where they live or where they travel. Stone steps in the forest, a path along the edge of a bluff, a row of beans, tulips arising from their winter sleep…all speak of human intention, and an attempt to “manage” nature in some way. And then there are the telling discards: mattress springs and liquor bottles buried under moss in the forest from a time before recycling became common, and—most amazing of all—the middens that ring our island, reflecting hundreds and hundreds of years of human habitation. Some gardens are rigorously formal; others delightfully haphazard. 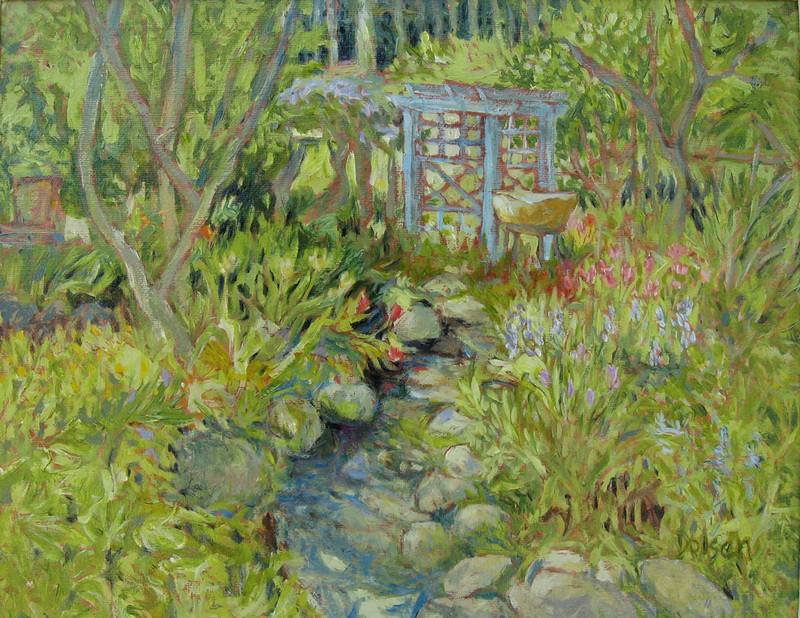 Sometimes gardens get “out of hand”: they reflect a desire at one time on the part of landowners to expand their sphere of influence beyond their ability to cope, and they become rough around the edges. “I don’t have enough time to look after it!” they will say, watching nature take its course and reclaim, weed by weed, their well-meant interventions. And Nature will take its course: no sooner do we leave off our efforts to plow, plant, clip, pull, arrange, re-arrange and replace than Nature arrives with her agenda intact. Our carefully built walls crumble and erode, our fields give over to weeds and neglect, our pathways become hidden, and deer graze their way, unconcerned, through remnants of our plantings. Still, the marks are there: faint but unmistakable indicators of human intention that proclaim, if not ownership, stewardship—a temporary status, at best. 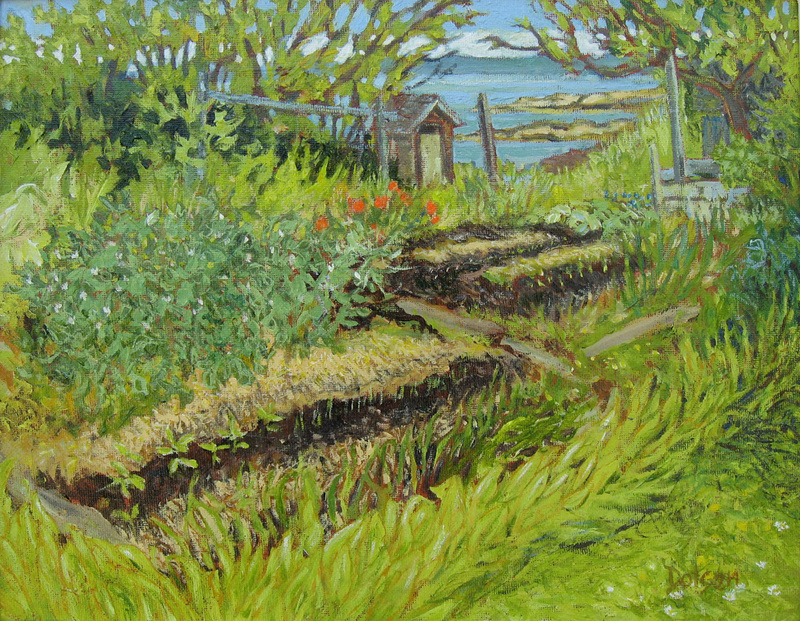 I was painting in Kath Benger’s vegetable garden the very afternoon of her death, and I call the painting “Legacy—the Promise of Spring” because any planting like that is an act of faith that, when we must leave it, becomes a gift to others to make of it what they will. 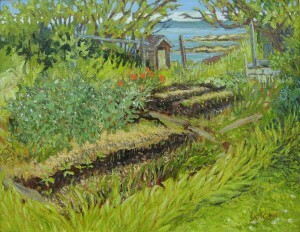 Her garden reflects decades of mulching and weeding, and a sort of faith that there is something sacred about stewardship of the land. 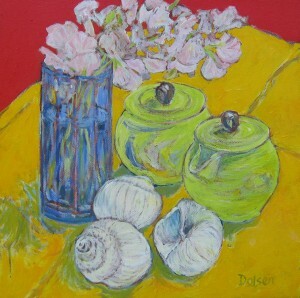 I didn’t know then, of course, that she would slip away from this life as I painted her bean rows, and the sea beyond. 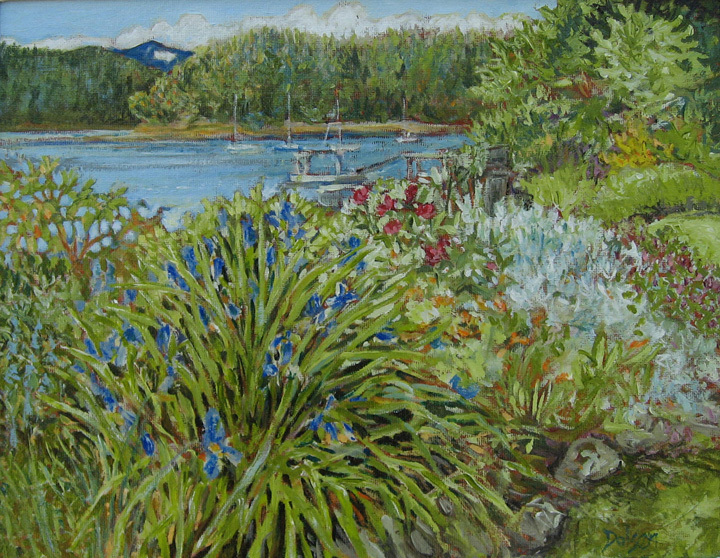 But I thought, as I painted, “Kath won’t mind.” And I thought of how she literally embraced the whole island, giving her loving attention to those she encountered, nurturing people and rejoicing in their growth just as she might, as an act of faith, plant beans and garlic and potatoes with the promise of life continuing, whether she is there for it or not. 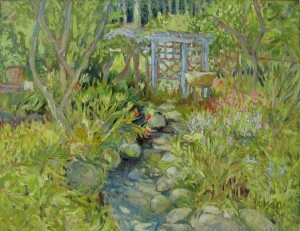 Maybe Art has something to do with this planting business, this nurturing of the spirit. If these images are nurturing, if they leave their mark, so to speak, then they have captured a moment of life, a sacred space, sunlight and shadow—the marks we leave in passing. 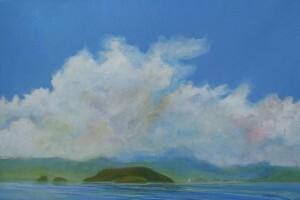 This entry was posted Tuesday, August 21st, 2012 at 11:26 am	and is filed under Uncategorized. You can leave a response, or trackback from your own site.